This year we had a real winter in South Florida. Since the end of December we have had consistent nights of at least 58 and below. Here it is March 14 and we are still expecting a few more nights of mid 50's temps. I know you people who live in much colder climes are yawning and rolling your eyes right now, but the critters and plants that live in South Florida find it hard to cope with colder weather than normal. I'm glad it's almost over. I'm about ready for the next two months which are usually very mild, yet still dry and just gorgeous. Then follows summer with it's daily thunder showers and rampant growth, which I also love. I just don't love the threat of hurricanes - but I'll cross that bridge when I come to it. It is still mid March and I have much to look forward to before we have to think about hurricanes. I sat in our back yard today - it was windy and warm in the sun, cool in the shade. The sky was intense blue and I saw some magic today. First the little Chipping Sparrows. We have tons of them this year. 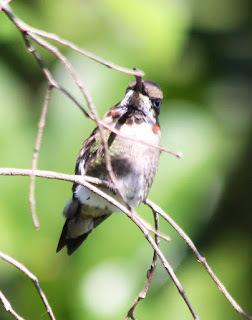 Below is a little female as she jumps from her branch perch to the ground. The next picture is of a male Sparrow taking a sand bath. I love to watch them as they huddle down in the sand, digging in a bit and then spraying sand over their backs with their beaks and fluffing their wings to get the most of the "bath". 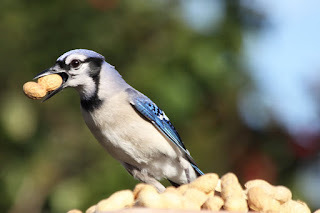 We love to put out unshelled peanuts for the Squirrels and Blue Jays. 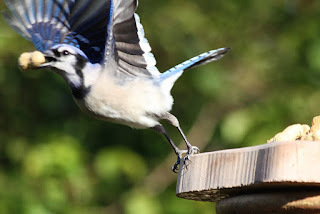 This one chose a peanut and then I caught him in mid take-off. 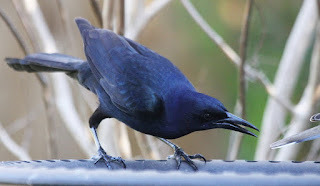 Boat Tailed Grackles, though they are mean gang birds, like peanuts too. Their colors are beautiful. 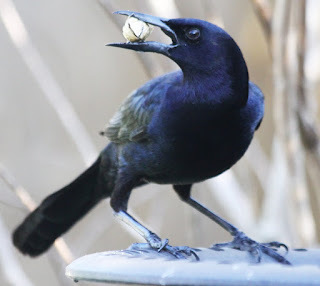 The Grackle soaks his peanuts and then crushes the shell with his beak and pokes at it, repeatedly dunking it, to get the peanut pieces out. 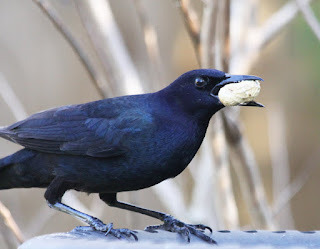 A Blue Jay started to try to steal the peanut and the Grackle is reaching out to bite the tail of the Blue Jay. He did actually grab the tail, the Blue Jay flew off and the Grackle came back to finish his meal. 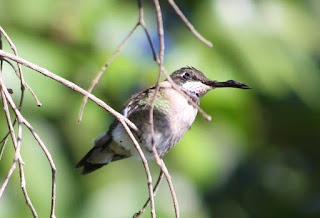 Next up - and most miraculous for me, since I've been trying to get these birds in our yard for a few years now without success.....a Hummingbird. 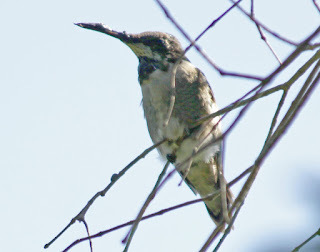 This one appears to have a growth of some sort on his beak, but it doesn't seem to be interfering with him. When I saw him, it was by accident. 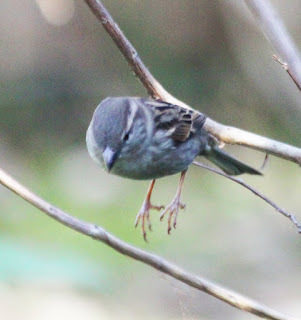 I was hunting for the Spot Breasted Orioles that keep cavorting through our yard and I noticed what looked like a leaf that was moving in an odd way. It was swaying back and forth in a rhythmic way - not like a leaf blown by wind. 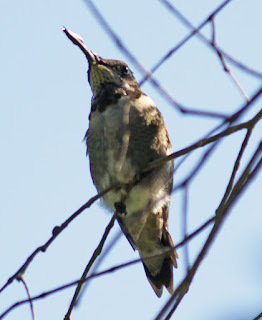 When I trained my camera on it, using the camera as binoculars, I saw it was a Ruby Throated Hummingbird trying to nap. Here are some pictures of him/her - I had to do some touch ups because at times the light wasn't good and I couldn't get too close. At last I got a few shots of the Spot Breasted Orioles. Here they are. When the sun hits them, they are magnificent. They seem to like the Cape Honeysuckle and the Hibiscus. 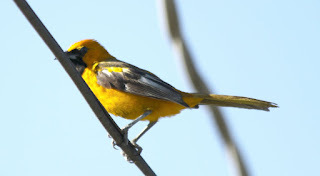 Unfortunately the only good shots were of them on electrical wires, which are unattractive and hide part of the bird. I'll have to keep trying to get better shots. 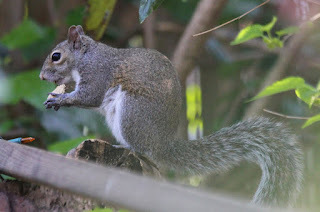 Finally - Mr. (or Mrs. - I didn't get a close look) Squirrel chewing on a peanut. My sister lives in Tampa and I know when she visits here in Autumn, she is cold all the time. I don't mind the cold myself. In fact, I enjoy it a great deal - I just worry about the birds and lizards and other animals that aren't used to it and will be stressed by it. We lost almost our whole population of Iguanas, but they were non-native, so that isn't a bad thing. Now, if only the cold has killed a lot of the horrible boa constrictors loose in the Everglades! That's true about the veggies and citrus. I'm not sure if there was damage this year or not - probably farther north. It almost got down to freezing for a couple of nights in a row here in January - it was in the mid 30's - which is unheard of here. I did lose one of my plants, and the others had some die back, but they are coming back. I love your photos. What kind of camera do you use? Both my husband and I have Canon D50's with interchangeable lenses. However - I know you visit Pure Florida and his photos are fabulous - and he uses a small portable Sony that has a good zoom on it. Much easier to carry and use. Thanks, by the way!! Suze, I did not know you were blogging. Lovely photos here. 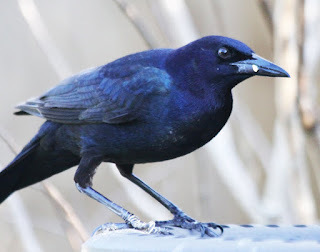 Grackles were my constant companions when I lived on the boat at Hollywood Marina. I had a kind of love hate relationship. Lovely to see you here. I haven't considered my blog as in the same category as yours, so I - in shyness, I guess - never put my blog address in any comments. Silly me - what does it matter? 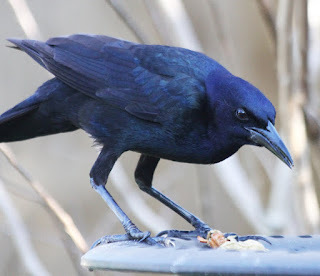 Grackles do indeed incite a love/hate relationship. They are what I call, "gang birds". So bossy. 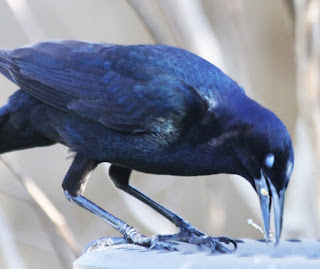 According to what northerners tell me (Grackles are up in the NE too) - they attack smaller birds. Luckily, I never see that unpleasantness, so I don't mind them. I love wildlife of whatever kind (I draw the line at roaches) - insects, lizards, little mammals - whatever stops by.